So I posted a while back on my plans to start my own atelier. These are progressing, mainly in the direction of business planning and logistics, the details of which are far too boring to post here. However... I'd love to canvas your opinion on a brand identity. This is obviously a very important decision and I want to get it right. I'm considering the low budget option. I'd rather put my money into equipment and materials than expensive name tags, so it's all about making the value option look classy. This means going for a great name on a very standard label design. I've posted a couple of mock-ups from the supplier's website. seemless: Probably the stronger of the two. I like that the alternative spelling means something slightly naughty. Then again, there are these guys. Absolutely not where I want to be! slash&couture: Less obvious but an accurate description of the construction process. I like the wordplay and the ampersand. I like both and I could happily fly with either of them. Which do you prefer? Or should I go back to the drawing board? In my last post, which seems like ages ago now, I mentioned that I've been offline while coming to terms with some life changes. But it's all good. The bigger picture is that I've been dealing with depression and burnout for the last year, and to cut a long story short I've lately made a breakthrough in my progress to recovery. As a result, I've decided to make a major change in the direction of my design practice. For the time being, I'm shelving digital design to focus on clothing. Regulars will know I've been a keen hobby sewist all my life, and by now I'm confident enough in my skills and knowhow to turn pro. I have experience in setting up and running a business to build on, so why not take the plunge? We only go around once, and I want to work on that one thing I'm passionate about, the thing that I think I do best. I've wanted to try this for many years but never found a business focus I was comfortable with. Lately, though, I've been developing some cutting techniques that minimise material waste and labour costs, and it's taking me in a whole new design direction. The idea is to create beautiful, wearable, downright covetable clothing from small pieces of the best offcuts I can source. I've been building up a stock of fine materials in the kind of quantities that would be hard to make into anything using standard cutting systems, but can be optimised with this method. For the technically minded, it's a departure from the standard Western blocks that takes its inspiration from a one-piece construction I learned years ago from a certain Japanese designer. 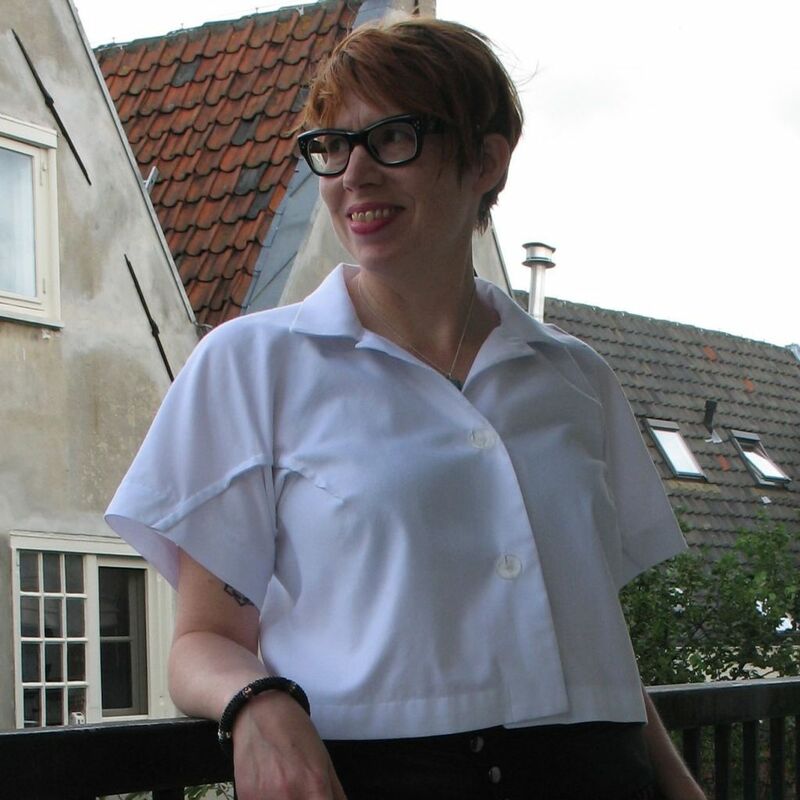 And now I humbly present one of my first wearable prototypes, a cropped white shirt made from a metre of fabric 150cm wide. It's cut in one piece, with two seams on either side and one down the back. I'm currently developing the concept into a basic jacket pattern and working on a couple of menswear blocks as well. I have a pants design I can cut from a metre and they don't look half bad, though I say so myself. And a few more garments in the pipeline. As you can imagine, I've been extremely busy with this lately and I expect to stay busy for a while to come. But I'm a huge fan of this wonderful community and I want to be a part of it. I feel very lucky to have met Angie, Greg, Inge and all the others this year. Your wisdom and feedback are invaluable to me and I hope to continue to grow and learn with you. I'm going to try to post every month or so, and hopefully look in for a chat once in a while too. So thanks, Fabulous, for welcoming me into the community and for reading this far. The sharp-eyed will no doubt notice that I finally found a fantastic pair of specs. Not quite such a radical change, but another step in a new direction. And I am in desperate need of a haircut, but who has time for that?